The Little Assawoman, Assawoman, and Buntings Branch watersheds are all part of the Little Assawoman Bay, and drain an area that extends from the Assawoman Canal to its confluence with Little Assawoman Bay on the southeast coast of Delaware. 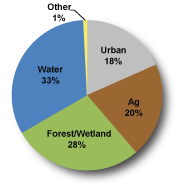 The land use of the watershed is made up primarily of agriculture and wetlands. 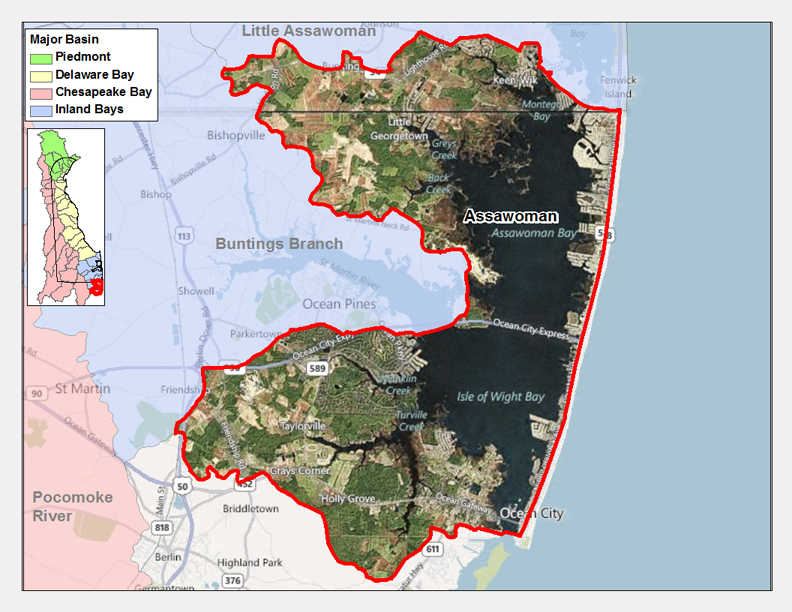 There is a bacteria TMDLs for the Assawoman Bay Watershed which requires a 40% reduction in freshwater nonpoint bacteria, 23% reduction in marine nonpoint bacteria, and a cap on point source bacteria at a geometric mean concentration level of 35 CFU enterococcus/100mL until all point sources are eliminated as required in the 1998 Inland Bays Nutrient TMDL Regulation. The Assawoman Watershed has a total of three sites listed in the Site Investigation and Restoration Section database. These three are state-fund lead (HSCA) sites. Each of the sites is sampled through the programs listed above for a consistent suite of environmental contaminants. These contaminants are broadly classified as Volatile Organic Compounds (VOCs), Semi-Volatile Organic Compounds (SVOCs), Pesticides, Polychlorinated Biphenyls (PCBs) and Metals as listed using USEPA and DNREC defined standards. When sites are adjacent to water bodies sediment samples are collected to assess potential impact from a site on the health of the waters. If you would like to view reports for any of the sites in the SIRS program please follow the link the DNREC Environmental Navigator to search by map for the Assawoman Watershed. Source: NOAA Coastal Services Center (CSC), Coastal Change Analysis Program (C-CAP) Land Cover data based on analysis of Landsat 30m resolution imagery. This website was created in partnership with DNREC, Division of Watershed Stewardship and the University of Delaware Water Resources Center.